In our previous article, we touched on the legality of renters installing apartment security cameras inside and outside the buildings. Today we roll out some helpful guides for choosing security cameras for your apartment, be it as a duplex, a small apartment, penthouses, Classic Sixes, lofts, one-bedroom apartments or a communal living in an apartment building or complexes. In order to cut through the information clutter, we roll out some well-received and trusted apartment security cameras, apartment security systems, and apartment alarm systems for landlords and tenants. 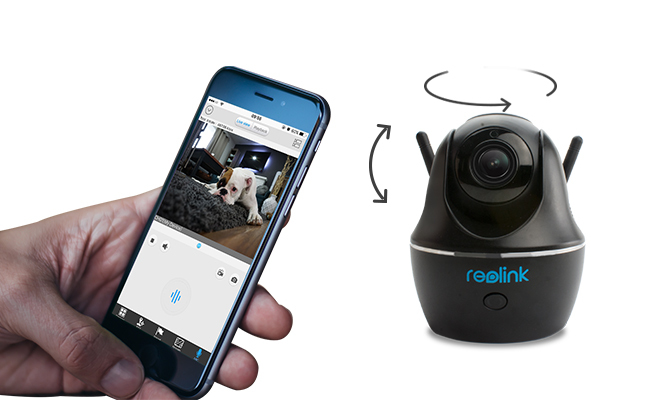 Reolink Argus® 2 is a great security camera for small apartments, apartment doors, one-bedroom apartments, apartment buildings, inside shared apartments, thanks to its hassle-free design and DIY simplicity. It’s completely wireless running over the rechargeable battery and connecting to WiFi, which means it requires no wires and no cables to set up. You could just set it up and leave it inside or outside your apartment. You could install this apartment complex security camera to your apartment door, or simply attach it to any metal surface. It’s always advised to place the apartment building security camera out of arm’s reach. Thanks to its motion sensor, push alerts and siren alarm, you’ll get alerts instantly when there is a motion, and it sounds siren to deter any uninvited. This sleek and compact apartment security camera Reolink Argus 2, with an affordable price, is beautifully designed to be low-profile, which allows it to easily blend in with your apartment interior decoration. Plus, it’s wire-free and portable, so you can place it anywhere you like or to be easily carried along. Watch the high quality video below shared by a user of Reolink Argus® 2. 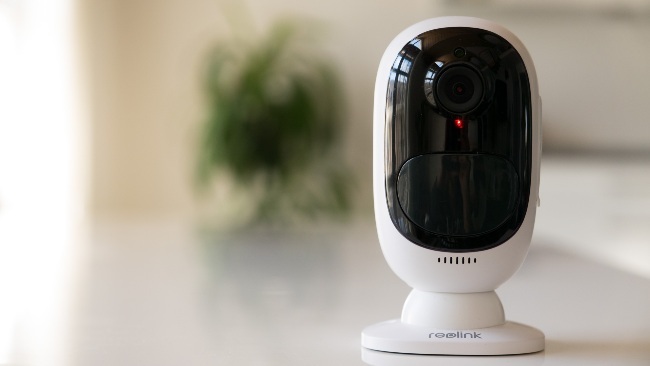 Reolink C1 Pro is a great option to serve as a wireless apartment security camera for keeping an eye on the small or medium-sized apartments. You’ll get notified if any unauthorized person gets into your apartment, landlords, roommates, maintenance workers, property managers, or anyone. You don’t need to drill holes because it can be placed easily in places where internet and power are accessible, and it’s highly portable, which allows you to carry it with you when you move. More importantly, this indoor security camera for apartment complex might fall well below your budget, priced at $84.99. Remote view & live stream via free apps on phones, Android, Windows PC, Mac, no subscription fee. Watch the below to see how this indoor apartment security camera performs at night. 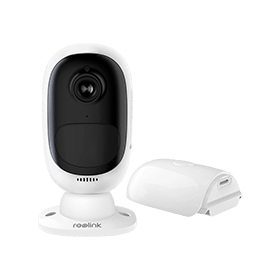 If you are in the market for a best rated and economical apartment security camera, Reolink RLC-410 is a right fit for you. This security camera for apartment door offers two version of resolution at your choice: 4MP & 5MP, which can deliver sharp and clear images with vivid details. It works great for those who are looking for security cameras at apartment complexes that can get the job done at an affordable price. Below is a video shared by a real user of Reolink RLC-410. 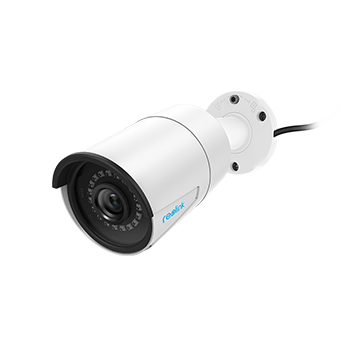 If you need more than two apartment security cameras to monitor large areas, you can look into the apartment security camera systems like Reolink RLK8-410B4. Of course, you could order Reolink Argus 2 camera 2-pack for indoor and outdoor apartment building surveillance. Or you could install or DIY an apartment security system with cameras to beef up apartment security. 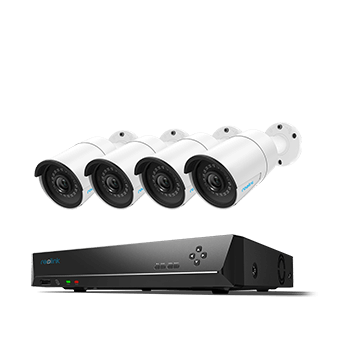 Reolink RLK8-410B4 comes with 4 RLC-410 wired security cameras and support 24/7 recording for around-the-clock surveillance. Choosing apartment security cameras or security systems is always a bit demanding. For that matter, it’s important to avoid some pitfalls by running through couples of questions first. What functions are you looking for in an apartment surveillance camera? Motion detection, motion alert, night vision, audio functions (speaker and microphone), remote access, and onboard storage? Do you want apartment door security cameras in standby mode which is activated by motion or always-on type? If you want motion alert, how do you want to notify, email, SMS, app push notification? Do you want constant recording or just motion recording? If you go for motion recording, where would you want to store the video, SD card, cloud, NVR, your computer? Do you want to pay to access your security cameras for apartment complex, app with a monthly subscription or free app for desirable functions? What’s your budget for an apartment security camera? Under $100? Around $100 or above? Wanna learn more about the apartment security camera laws or how to install security cameras in an apartment? This part is going to solve all your questions about security cameras for apartment. Q1: What Are the Apartment Security Camera Laws? Can I Legally Place a Security Camera in Apartment Buildings? Actually, there is no quick answer. The apartment building security camera laws depend on whether you are a landlord or a tenant, where you place the apartment surveillance cameras (public areas or private places), your state and local laws, the type of apartment security cameras you use, etc. Note that video recording and still picture taking is perhaps within your rights, but audio recording is another thing in most circumstances. • Learn the legality of installing apartment security camera systems as a landlord here. • Check out whether it is legal for tenants to install security cameras for apartments. If you are a tenant and want to install an apartment security camera inside the building, it is highly recommended that you go for the complete wireless security cameras for apartment, like Reolink Argus® 2, which require no drilling holes or messy cables, so that you won’t be responsible for the mutilation of property. Q3: How Much Internet Do I Need for an Indoor Security Camera for a Small Apartment? Here is the fact: the apartment security cameras won’t eat Internet data unless you access the cameras for live viewing or they send you alerts when motion is detected. Even if your Internet connection goes down, the security cameras for apartment complex with SD card can continue to record onsite even without network (remote viewing and instant alarms are not available). Or if there is no Internet in your place and you need an apartment building security camera for remote viewing, the cellular 4G security cameras would be your best bet. Whether you are concerned about possible apartment break-ins or unwanted disturbance, having an apartment security camera as an extra pair of watchful eyes is never a mistake. And proper protection and maintenance of your apartment security camera systems are necessary to prolong their lifespan. This entry was posted in Buyer's Guide and tagged apartment buildings, apartment security, installation, laws, security cameras. Question: can these cameras be turned on and off via the app? I would like them to run while I’m out, or asleep, but not while I’m living my daily life in the apartment. Thanks! You could tun off the motion-activated cameras like Reolink Argus 2 /product/argus-2/, Reolink Keen /product/keen/ by switching off the PIR motion sensor right in the apps. 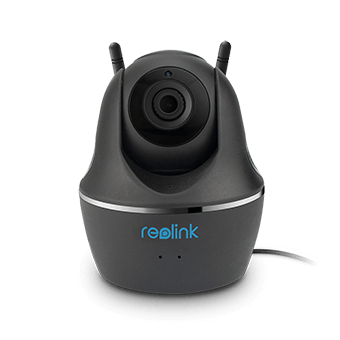 For cameras like Reolink C1 Pro /product/c1-pro/, you could simply change the pointing angle or unplug them while you are at home.